Are you redirected straight to searchlock.com when your browser is opened? Are your default search engine and homepage gone? If you can answer positive to these two questions, we are sure that you have become a victim of an infection called a browser hijacker. These infections are called like this because they change browsers’ settings and do not even need permission to do that. In other words, they always act behind users’ backs. We can say the same about searchlock.com, which is the subject of this article. It illegally enters computers and hijacks all browsers, which is why it is opened automatically to users. Although searchlock.com is presented as a legitimate search provider, it will not act beneficially because its main purpose is to generate commercial advertisements to users. Because of their presence, all kinds of problems related to security can emerge. You should not let this happen – uninstall searchlock.com from browsers today. Find the information about the searchlock.com removal provided in the last paragraph. searchlock.com is not one of those trustworthy search tools like Google or Yahoo. Instead, it is a website that only pretends to be a legitimate search provider. 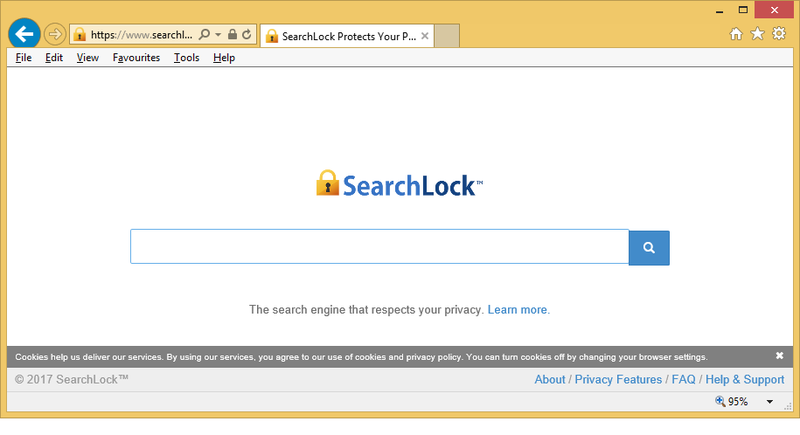 Unfortunately, there are many users out there who do not know that and, consequently, use searchlock.com as the main tool for searching the web. Those users risk ending up with serious malicious software on their computers because searchlock.com might provide them with advertisements which advertise malicious pages containing bad software. Malicious software might quickly show up on the system without permission, and, unfortunately, it will be very hard to get rid of it. If searchlock.com has been set on your browsers for a few days only, you can still prevent security problems from emerging by going to implement the full searchlock.com removal. Delete searchlock.com from browsers as soon as possible to protect your privacy too – this untrustworthy website might gather information about users. How did the searchlock.com browser hijacker enter my computer? Since browser hijackers are already very prevalent infections, it is no more a secret how they are distributed. Bundling is the main method employed by cyber criminals to spread these threats, but they might also be advertised on P2P pages as useful software. It does not matter which of these distribution methods were used to reach your computer because you need to remove searchlock.com in any event. The last paragraph is focusing on its removal, so read it carefully. How can I delete searchlock.com from browsers? There are two ways to remove searchlock.com from browsers, and this needs to be done as soon as possible. The first one is the manual method – users have to remove this undesirable search tool from browsers manually. The second one is the automatic method – the searchlock.com removal needs to be implemented using an automatic tool. The second method is considerably easier, but users first need to get a legitimate anti-malware or anti-spyware tool from the web. If you are not an advanced user, you should not even try to remove searchlock.com manually, in our opinion.